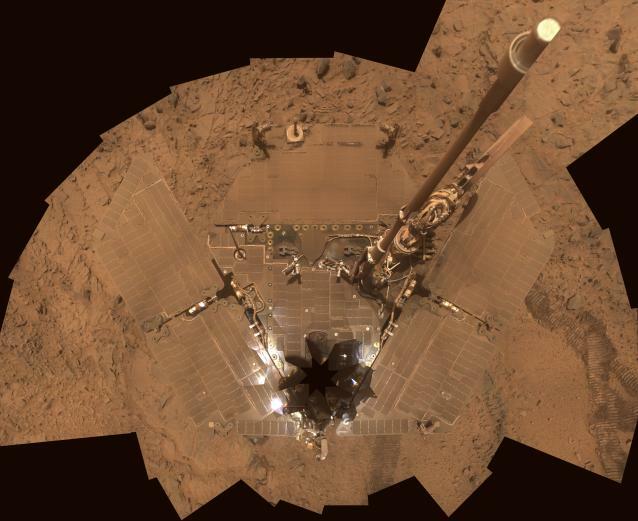 Just ten days after the Mars Phoenix lander fell silent, the Spirit rover, one of the intrepid twin rovers exploring the surface of Mars for almost 5 years, is in serious trouble due to a dust storm. Yesterday, NASA didn't hear anything from Spirit. This means one of two things: either it received its energy conserving instructions and is following them, or the instructions came too late and Spirit is dead. The third option, that Spirit didn't get the instructions but is still alive, is ruled out, because Spirit would be radioing data or radioing for help. So, this is a nail-biting time for the Mars rover team. It's like parents hearing their kid in the next room, jumping off on and off the furniture. So the parent yells, "stop that, or you'll get hurt!" And then silence falls. Did the kid stop the jumping, or did they actually get hurt? We'll know more later today. Update: NASA announced today that Spirit did communicate, as instructed, and so is still alive. The future is still uncertain, but she's still with us. It's a bad time for Spirit to be having trouble. Mars is about to move behind the sun, as seen from the Earth. During this time of conjunction, any radio waves between Earth and Mars get messed up by the sun, so it's not possible to communicate detailed instructions clearly with the rover. (Some minor communications can get through, but not much more then beeps saying "Hi, we're here, we'll call back tomorrow!") In about another week or so, we'll have to let Spirit try and survive on its own for a few weeks. Even if Spirit does not survive, it's important to remember that the rovers were designed to last for three months, and they've survived for four-and-a-half years. In a harsh place like Mars, that's not too shabby! And Spirit's twin, Opportunity, is still happily scurrying across the plains of Mars half a planet away.